Want to know more about Retford - beyond the simple fact that it is about 2.5 miles from Clarborough and Welham? If you are new to - or just visiting - the area, you really must have a look at Retford’s Market Square, one of the region’s best-kept secrets, for a feast of Georgian atmosphere! See our Local History pages for more. Bassetlaw is not a name that jumps on the tongue if you live in most of the UK! This single fact has led to an extensive consultation process over the past few years leading to the idea that we ought really to project ourselves to the rest of the world as North Nottinghamshire. This is a programme that has just been launched, so visit the dedicated website to get on board with the concept! 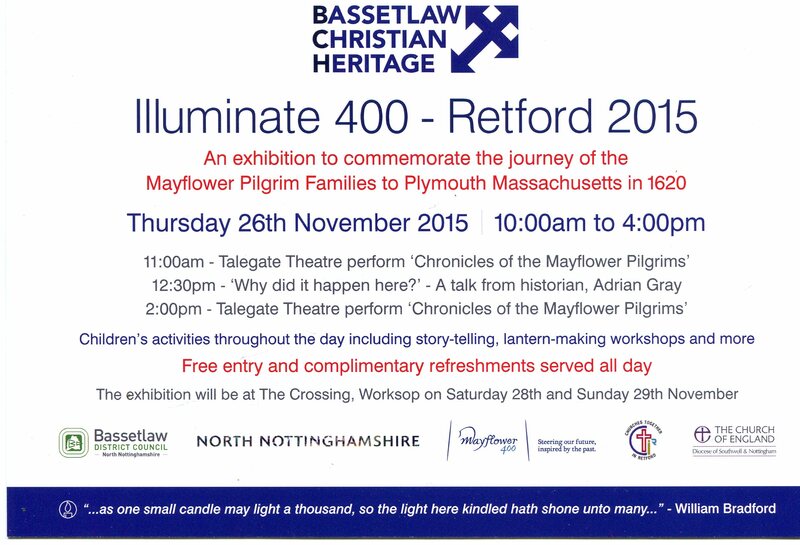 Retford is a focus for the 400th Anniversary of the Mayflower Pilgrims’ flight to America - read more...about 26th November 2015 events. airport. For something really different, why not get involved? or go to their new website here. What’s on at Idle Valley Nature Reserve? Click here to find out more. What’s on at Retford’s Majestic Theatre? Click here to find out. What’s on at Retford Little Theatre? Click here for more. Find out more about Retford at Retford Civic Society’s website here. Download Nottinghamshire County Council’s WhatsOn Guide here. Remember: table-top sale takes place in Clarborough Village Hall on the first Saturday of every month. See Church website from our Local Groups ► Group Links page for details. Nottinghamshire County Council announces plans for £13 million development of Robin Hood visitor attraction. Always remember - much more information is always available at your local library Retford (Denman) Library and Bassetlaw Action Centre.